The following table gives the compatibility matrix of the solid-state memory cards and the known industrial devices. 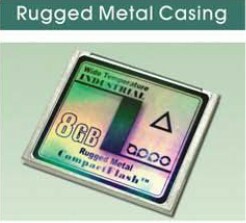 PSI supplies both commercial-grade and industrial-grade ruggedized cards with commercial and extended operating temperature options. (industrial grade cards available, click here) Acura MDX Navigation; AG Leader PFadvantage yield monitor; AT&T/Avaya Phone systems; Bernina Sewing & Embroidery Machine Artista 200E; Case IH Ver4.5 yield monitor; Casio Cassiopeia A-10 , A-11 & A-11 Plus, Z-7000, Casio Japan Cassiopeia A-50; Compaq Companion-HPC C120, C120+, C140, C-series 810, 2010 & 2015; Entek 1200 Vibration Analyzer; Flir (Infomatrics) MP290 thermoCam (Sandisk); GE Fanuc CNC Series 18-B, 18-C, 18i-A, 20-A, 21-B, 21i-A (Sandisk); Geomation 2380; HP OmniGo 100/200 & 200/300/320/360/620/700 LX; Hitachi HPC & HPW10E (up to 20 MB); Honeywell Multi-Trend; IBM TP 700T; Janus (Intermec) 2020D, 5020; Leica GS50 GPS (Sandisk); LG Electronics GP 20M/40M & Phenom HPC; Lucent CBX500 and GX550; Merit Game machine; NCR 7450 POS; NEC MobilePro 200, 400, 450, 700, 770, 780, 800; Novatel Wireless C-O-N-T-A-C-T; Oxford FD4; Prolinear HPC; Respironics SmartMonitor 2; Roland AR-3000, MS-1 Sampler (Sandisk); Sharp Mobilon HC-4000, 4100, 4500; Zaurus MI504, 506; Toshiba T200; Trinble GPS Logger, Tharo printer, etc. (industrial grade cards available, click here) Advantest U-3641 analyzer (2MB), AG Leader yield monitors (w/o 2KB); Alesis DM Pro, S4 and QS Series music keyboard/ synthesizer; ; Amstrad NC100, NC200; Apple E-mate 300 , Newton 100, 120, 130 & MessagePads (with 2KB); Applied/PE Bio system PCR9700; BSS FDS-388; CSI 2120 analyzer (8MB); Case IH yield monitor (w/o 2KB); Casio Zoomer Z7000; Chroma video generator 2329; Clavia Nord Lead Synthesizers; Compaq HS-D40, J40, J50 & Z50 controllers; Dipstick 2000 floor profiler; Dranetz PP4300; Emerson CSI 2120-2 vibration analyzer; Ensoniq KT & MR Series; Entek IRD Vibration Analyzer DP1500; FATO CL408 Printer; Fluke Hydra 2635A; Fujitsu Poet; GE Fanuc CNC Series (need attribute) 15-B, 16-B, 16-C, 16i-A, 18-B, 18-C, 18i-A, 20-A, 21-B, 21i-A, Power Mate H (PM-H), PM-1, Motion Mate MCS700; HP 95/100/200/700 LX, 1000CX & OmniGo 100/120 & 8935 series Analyzer; Interek (RRD)1250; Intermec Janus 2010 **(see below), 2020, 5020; IRD Datapac 1500; Janus 2010/2020; Kantrox MUX; Korg 01/Wfd; Kyrocera-Mita printers; LaserAtlanta Rangefinder; Leica TC1100, TCA-1600, TCR 1102; Magic Cap DataRover; Markem printers; Micro-Trak & Satloc Yield Monitors (w/o 2KB); Midas XL4; Motorola Envoy 150 (2MB) & Marco (2MB) (with attribute); Nikon DTM720 survey instrument; Omron CVM1B PLC (2KB); Pfaff sewing machine; Rockwell DP1250, DP1500; Roland AR-3000, MS-1; Sharp Mobilon HC-4000, 4100, 4500, PDA 3100, Zaurus ZR5000, 5700, 5800 (with attribute, 2MB), Norand; Sony Magic Link (with 2KB); Satloc GPS system (w/o 2KB); STA DP2624; TekLynx PrintPad 2000; Telxon PTC1140; Topcon FS & GTS data collectors; Toyo TM150 molding machine; Two Technology PCL-50 terminal; Trimble NT200D; Vandorn Demag Pathfinder 5000; Videx Omniwand; Wavetak data collector, etc. MLC and SLC are different production processes. 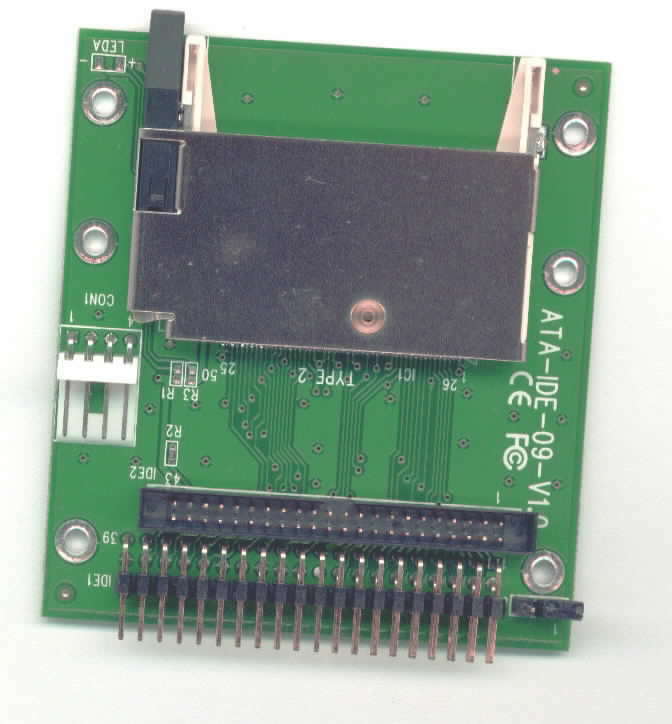 MLC NAND flash is appropriate for short-term, price sensitive applications. It mostly applies in consumer market, because it is much cheaper and can be packed with higher capacity. Industrial customers prefer to use SLC NAND flash ICs because they offer highe, more reliable performance and much longer life cycles. For Samsung NAND Flash as an example, SLC NAND flash offers 10 times as long programming cycles as the MLC flash. Please click and read here to find out the advantages of the SLC Flash ICs and the comparisons between SLC and MLC. 3. 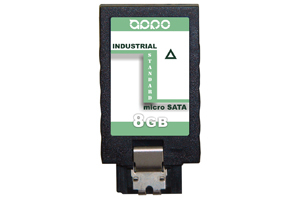 Industrial-Grade SLC PATA (IDE) Flash Drives: 1.8" & 2.5"
For MLC industrial USB flash drives, please go to here. 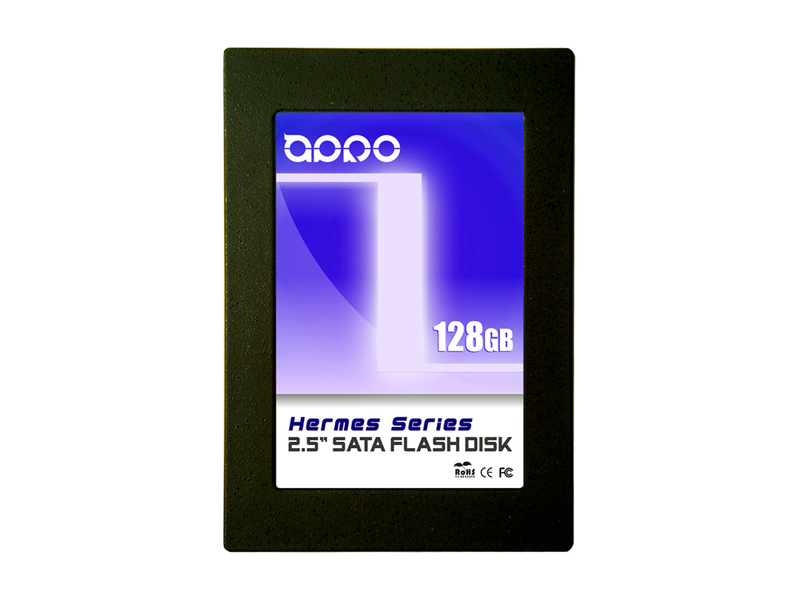 Please click here for pricing and more info of APRO & C1's MIDE flash modules or here for Smart Modular embedded flash modules. They are your great choices for the rugged PCs, industrial PCs and embedded PCs. 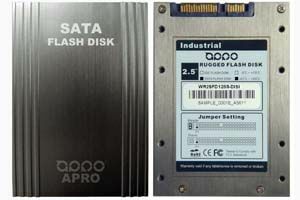 Please click here for Smart Modular high-speed SAS and SCSI flash drives. 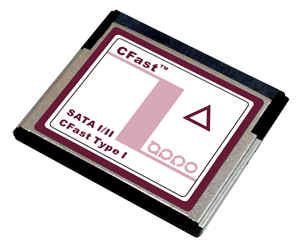 Please click here for pricing and more info of the industrial SD, SDHC & MicoSD Flash Cards, by C-1 Technology, APRO & Smart Modular. 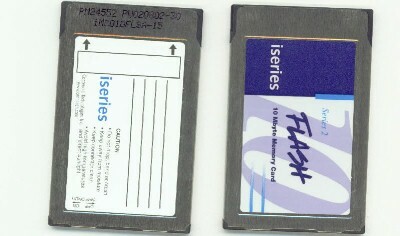 PSI supplies linear flash cards and SRAM cards for routers, industrial data collection devices, etc. Please click here for more info of linear flash cards and here for SRAM cards. 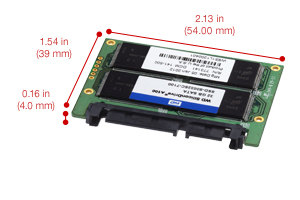 MO-297 defines the dimensions, layout and connector position for 54mm x 39mm solid state drives with a standard SATA connector. 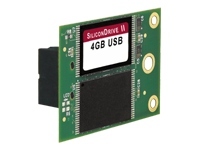 These fast performing drives offer low power consumption along with best-in-class reliability. Please click links below.